A question on Kaun Banega Crorepati yesterday drew my attention to the immortal Qawwali, made famous to my generation by Bangladeshi singer Runa Laila, ‘Dama Dam Mast Qalandar’. The original Qawwali is believed to have been written by Amir Khusrow, but its Punjabi version was written by a Sufi Master Baba Bulle Shah. 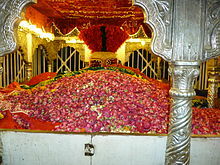 Both versions are in praise of the revered Sufi Saint Shahbaz Qalandar, whose dargah is at Sehwan Sharif, near Larkana, in Sind, Pakistan. Shahbaz Qalandar lived in Sind and taught the Sufi way of compassion and inner peace between 1177 AD and 1274 AD. Qalandar is a Sufi title bestowed on those who are considered free spirits, detached from worldly interests and desires, and who are on this planet to serve, to touch lives and to make the world a more caring and loving place. When I think about it, I am reminded about what Osho, the Master, has said. He explains that the seed of love is in all of us. All of us are created with love. And love is our intrinsic nature. It is because we have all developed worldly attachments, or allowed emotions such as fear, anxiety, work, greed, lust, hatred, anger and jealousy to control us, that our true nature – love – lies suppressed. When we peel off all those negative emotions and when we let go of all attachments, we will see our native state blossom. We then will be free spirits, without any worldly shackles. We too will be mast Qalandars! Enjoy this beautiful song, celebrate your weekend and think about how beautiful Life will be if you are truly free – unburdened, unshackled. Your true, real Self becomes you, O! Qalandar! What are you waiting for?